Gor Mahia beat City Stars 2-1 to record their third win of the season in a match played at City Stadium on Saturday. Throughout the year, Gor Mahia have been playing with a lone striker supported by a winger or two. On Saturday they played with two strikers, Midenyo and Ngwa. This seemed to work out better. In the 27th minute Ngwa set up Midenyo for the 1st goal. Gor Mahia continued to look dangerous and it came as no surprise when Ngwa notched the second goal in the 34th minute. Again it was a result of actions from both strikers. Midenyo ran dangerously in the City stars area but his effort was parried by Ronny Kagunzi the former Gor Mahia goalkeeper. Ngwa took advantage of the loose ball to score. City stars pulled on back in the 70th but Kogalo held on with Mosoti and Anguyo rock solid at centre back. 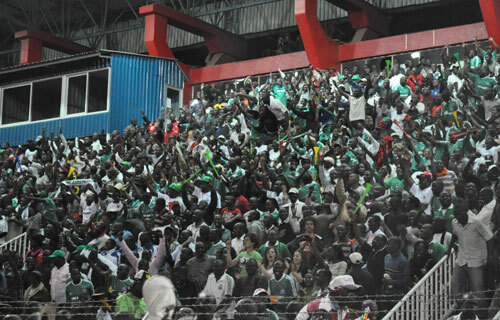 Muchh to the relief of fans who had earlier been banned from this game Gor Mahia held on for a win. Kevin Ochieng and Rama Salim have been named to the national team that is due to start preparing for the Africa cup qualifiers. Also named is Collins Okoth who is still listed as a club player despite having left. Eama Salim has been one of the few bright spots on the team this year. He joined the team after gaving put on dazzling displays last year for Congo United. Kevin Ochieng is a vastly experienced player who has seen national team duty several times. Defenders: James Situma(Sofapaka), Mulinge Ndetto(Ulinzi), Pascal Ochieng(Rangers), Brian Mandela and Jockins Atudo(Tusker), Dennis Odhiambo(Thika United) and Joseph Shikokoti(Tusker). Was Blackberry given a chance ? Little over a year ago, former Gor Mahia striker George Odhiambo “Blackberry” left for Denmark to play for top tier side Randers FC. This occured after he had taken the Kenya premier league by storm, scoring some breathtaking goals that saw him earn a place in the national team as well as several accolades such as premier league player of the year. He looked set to take Denmark by storm. Things however did not go according to plan. Blackberry soon found himself warming the bench endlessly. There was no explanation from the technical bench as to why he was not getting playing time. Even when Randers were demoted to the Danish second tier, he was still not getting to play. The explanation from the Danish side was that Blackberry was not adjusting to Danish football. It was inexplicable because he played well whenever given an opportunity to showcase his skills. In the 14 months he spent in Denmark, he made only two appearances. The writing was on the wall when Randers went to Turkey for a pre-season trip to Turkey but Blackberry was not included. So he asked to be released for tryouts in Finland with club side Kups. Despite impressing, the Finnish side did not select him. In the last few weeks, Blackberry seems to have lost his patience and had a run in with his coach. He cites the souring relationship between himself and the coach Michael Hemmingsen as the reason why he and Randers FC decided mutually to terminate the contract. It is likely that Blackberry was frustrated at his lack of playing time. Indeed he made his frustrations known to the Danish media. Perhaps not a good idea. But why the club never gave him a chance to prove his worth is not easy to understand. Who knows maybe they wanted to deliberately frustrate him until he had no choice but to leave. 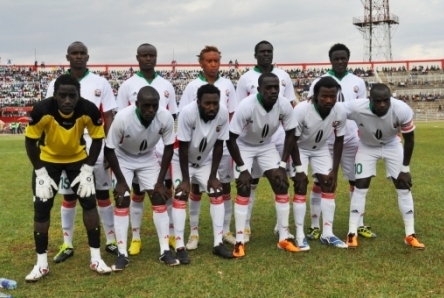 Denmark has not been a happy hunting ground for Kenyan players. Emmanuel Ake played for several Danish clubs but recently saw his work permit terminated. Anthony Akumu recently had unsuccesful trials as did Pascal Ochieng 6 or 7 years ago. For that matter, few Kenyan players have found success at Europe’s top tier sides. We hope that Blackberry will use this setback as motivation to work harder towards his ultimate goal. We also hope that he has learned a few lessons that he can apply in his next station. Posted in: Articles20 Comments on Was Blackberry given a chance ? Gor Mahia Croat head coach, Zdravko Logarusic has urged his players to step up their game to ensure they improve their Kenyan Premier League (KPL) standing after a poor run this season. The former Ghanaian top flight side Ashanti Gold boss, who has endured an indifferent start to his tenure at the club, is working to ensure the side establishes a consistent run in the competition starting with their weekend clash against basement side City Stars. “We want to climb up in the standings by displaying great style of play compared to the other previous matches. We are also trying to find the system that works to win other competitions we are still involved in,” Logarusic stated. The Croat is also aware of the potential of an upset against the relegation threatened Stars whom they welcome at their City Stadium citadel. “We can’t underestimate our opponents since they give 150 percent against big teams. Hence, we have to put more effort because it will be a tough match us,” he cautioned. Gor are sitting 12th on the log on 10 points, two adrift of their opponents as they seek to stem a run that has seen Logarusic register a win, draw once and lose twice following his highly publicised hiring last month to rescue the 12-time domestic titleholders. Their recent seesaw form has seen K’Ogalo enjoy the high of beating title challengers Sofapaka at home before losing to Ulinzi away inside a week. Gor Mahia coach Zdravko Logarusic isn’t a happy man. He is deeply frustrated at his new club. Logarusic, who took the reins at K’Ogalo last month, has differences of opinion with the club’s leadership. Speaking to the Daily Nation in Nakuru at the weekend, the coach said although there’s been a slight improvement in performance, he hasn’t been given a free hand to institute the changes needed to turn around K’Ogalo’s fortunes. The Croat feels “excessive and inexperienced baggage” in the team must be offloaded immediately, while the club’s leadership insist the coach must work with the current squad because many of the players are “young and talented”. “I need to clean up the house because I will not work with an inexperienced team who fail to perform despite given time to improve. Gor is not a testing ground where poor players are given an opportunity to sharpen their skills, and still fail,” said Logarusic after his team’s 1-0 loss to Ulinzi Stars at the Afraha Stadium on Saturday. Gor vice-chairman, David Killo, admitted that they had not given Logarusic “a 100 per cent free hand” to run the team, adding that the Croat should “go slow” on his plan to sack some of the players. “It’s true we haven’t given him a 100 per cent free hand to run the club, because there are areas he is restricted and must consult us,” said Killo, who is also the club’s Technical Committee Chairman. “He is a bit impatient with the current Gor playing unit which comprises young and talented players who are still learning,” he added. Logarusic urged the club’s leadership and fans to refrain from the culture of passing the blame to the referee every time they lose a match. “We should change this attitude of blaming the referee every time we lose,” Logarusic said. Gor had a penalty call dismissed by the centre referee Sylvester Kirwa after Ulinzi Stars defender Lawrence Owino had handled in the box. Football Kenya Federation (FKF) has announced the formation of a Special six member Independent Displinary appeals Tribunal (IDAT), a supreme body appointed to listen to Gor Mahia’s appeal against an IDCC ruling that banned their fans from attending their home matches for the next three fixtures. “But we warn the fans that if any repeated incident of hooliganism during their current matches will be witnessed, the federation will have no option but to impose further sanctions, so we appeal to their fans to be of good behavior.” Nyamweya added in the statement. Gor Mahia’s next match at home is against Nairobi City Stars at the City stadium next weekend. Hopes of a revival were dealt a severe blow when Kogalo lost 0-1 to Ulinzi at Afraha stadium. Nakuru has not been a happy hunting ground for Gor Mahia lately so this loss was not out of the ordinary. The goal came 2 minutes before half time via a Stephen Waruru freekick which beat Jerry Onyango all the way. In the second half, Gor Mahia pushed for an equalizer which was not to come. Once again, Gor Mahia’s inability to score in open play was exposed. In the first half, Ulinzi were clearly the better side. Coach Logarusic even admitted that his side did not deserve to win. Also difficult to understand was the fielding which saw David Owino who is a defensive stopper, fielded as a winger. In an unfortunate incident after the match , some Kogalo fans accosted the players who had boarded the minibus demanding answers. LINE UP: Jerim Onyango, Musa Mohammed, Yusuf Juma, David Owino, Donald Mosoti, Ivan Anguyo, Anthony Akumu, Kevin Ochieng, Rama Salim, George Midenyo, Kevin Omondi. Subs: Wycliffe Kasaya, Solomon Nasio, Moses Otieno, Baldin Ngwa, Edwin Lavatsa, Dan makori and Duncan Owiti. Kenyan Premier League (KPL) giants Gor Mahia have made good their promise to contest the ruling made by the Independent Disciplinary Complaints Committee (IDCC) following their troubled derby game against arch rivals AFC Leopards in March. The club is however, not appealing to the body that made the decision to have them play three KPL games behind closed doors as the secretary general Mr. George Bwana says the IDCC did not give them the option. They have thus decided to write to the topmost office in charge of football governance in the country, the Football Kenya Federation (FKF) and hope to get a fair hearing. -We have sent an appeal requesting the status quo to remain and we are hoping that our appeal will be heard, he told futaa.com. -We have appealed to the federation – to the FKF chairman because IDCC didn’t give us that option of appealing to them, which we feel is unfair. Even in a court of law someone is given the chance to appeal. -Fortunately we have an office (FKF) mandated to run football in Kenya, and since this is a serious football issue we decided to present our complaint to the highest office in charge of football governance, he said. Aside from the three games behind closed doors verdict, the club was also told to furnish the disciplinary committee with a plan of how they will organise security in their home matches. 2. Claims that he at times worked to sabotage the team, e.g by throwing away a penalty against Muhoroni youth. 3. The information fed to new coach Zdravko Logarusic about him, which he says was negative and portrayed him as indisciplined. 4. Claims that he only chose certain games to play in, and opted out of others. Gor Mahia swiftly reacted, issuing a statement that they had suspended the player for alleged breach of contract. The player reacted by saying there was no way the club would force him to play for them. But several legal questions beg in as far as the player´s contractual status is concerned, not to mention the rights and obligations of both Gor Mahia and the player under both the Kenyan football regulations and in the eyes of FIFA and international sports law. Did Okoth have just cause for terminating his contract? The FIFA regulations, jurisprudence, and case laws issued by the Court of Arbitration for Sport are clear on acts which justify the unilateral termination of a contract by a player. Such grounds range from among others subjecting players to prolonged periods of unpaid salary exceeding 3 months, or if an established player has only been fielded in less than 10% of the team´s official matches in the course of a season. Relating the said grounds to the facts, Okoth had no just cause to terminate the contract. It could be that his contract with Gor Mahia contained clauses entitling him to terminate the contract on any of the 4 grounds invoked by him, but this seems highly unlikely. But even before terminating a contract, a player must first serve the club with a notice asking it to stop breaching the contract. The absence of a notice could invalidate any just cause for terminating a contract. In Okoth´s case, he ought to have informed the club of what he perceived to be conduct in breach of the contract or report his “feelings” to the club´s board with a view to finding an amicable and internal solution. The first remedy Gor seems to have taken is to suspend the player. This was valid and within the club´s rights pursuant to its internal disciplinary regulations. But the said suspension has at the same time been overtaken by events and carries no legal effect given the fact that Okoth has already terminated the contract. But another remedy available to Gor in Okoth´s post contract era would be suing the player for unilateral termination of contract. Gor can seek compensation under the Kenyan football regulations, and such compensation ought to be in tandem with article 17 of the FIFA regulations on the status and transfer of players. Assuming Okoth had not terminated the contract but had only been suspended and thereafter issued a statement saying that he would not play in any of Gor´s matches, the club cannot force him to play after the end of his suspension. Under the general principles of international sports law, and taking the Carlos Tevez case as an example, a club cannot force a player under contract to play. The only remedy a club has in such a situation is to fine the player, keep suspending him or to terminate the contract for just cause on grounds of desertion. Can Okoth buy out his contract? The so called concept of lex sportiva, allows players to compensate their clubs buy buying out the remaining part of their contract. This, however, does not exonerate the player from further liability. A player can only buy out his contract if there exists a clause in his contract entitling him to do so. I have not had access to Okoth´s contract but I believe that no such clause exists. I also do not think Okoth´s sentiments that he had reached an agreement with the club to buy out his contract is true, given the fact that the club issued confirming his suspension. The player seems to be confusing between a buyout clause and the concept of compensation based on the “remuneration and other benefits due to the player under the existing contract” as established in article 17 of the FIFA regulations on the status and transfer of players. True, the FIFA regulations, and I believe the Kenyan football regulations do state that compensation for unilateral breach of contract shall be based on among other criteria, the “remuneration and other benefits due to the player under the existing contract”. But this is not the sole and only decisive factor. Various other factors come into play in determining the amount compensation due from a player, such the remuneration due under his new contract, the fees and expenses paid and/or incurred by Gor Mahia and also the concept of specificity of sport. I therefore do not think Okoth can be said to have fully compensated Gor by offering to pay them the remaining part of his salary. The player might be forced to pay further compensation under the arm of specificity of sport. In other words, there are certain damages unique to sports which players and/or clubs might pay each other for unilateral termination of contract in addition to the remaining salaries due under the old or new contract. Compensation specific to sport includes aspects relating to the player´s image rights, fame, status and marketing brand to his club. Evidence of the costs incurred in replacing the player him, the financial investments Gor made in training him, or evidence that that Gor´s performance substantially declined following the player´s breach may also be considered in awarding further compensation. Pursuant to FIFA jurisprudence as well as case law established by the court of arbitration for sport, compensation under the arm of specificity of sport Is awarded don the basis of the player´s 6 months’ salary under his old club. All in all, Okoth is now a free player and he may sign for any club he so wishes. The much awaited IDCC verdict has been rendered. Gor Mahia will have to play 3 home matches in an empty stadium. The 3 matches will be City Stars (28th April), Chemelil Sugar (6th May) and Western Stima (19th May). Secondly , the club must in 15 days present a plan for how they will implement security arrangements for future matches. Failure to do so will results in a further 2 matches being played in empty stadia. In addition, the club must meet all IDCC expenses with regard to the issue at hand. AFC Leopards demand for 3 points was thrown out by IDCC. It was comical to see AFC officials play acting as if their fans have never caused fracas. A classic case of the pot and the kettle. The IDCC verdict was rendered by the comittee led by former Kenya Rugby Football Union Chairman Richard Omwela. Other members are vice-chairman, Prof. Migai Akech and members, William Odeny, Elijah Gitonga, , David Otieno, Njeri Onyango and Penninah Wahome.